I can't recommend this film highly enough. I went to see The Young Victoria last night and whilst I expected to like the film I didn't think that I would be blown away by it. However, it's certainly one of the best films that I've seen in a very long time. The performance from every one of the actors was superb. 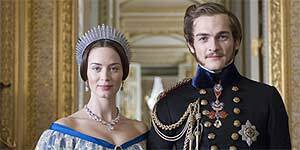 Both Emily Blunt and Rupert Friend are totally believable as Victoria and Albert and manage to convey a spectrum of emotions even with only the slightest of facial movements. By far and away the most compelling aspect of the film is Victoria's humanity and the incredibly romantic relationship that she had with Albert. Guaranteed to thaw even the most cynical of hearts and if you didn't believe in soul mates before seeing this film, you'll find it hard not to afterwards. If you've a tendency to cry at films, make sure that you take plenty of tissues! The costumes and sets are all just as incredible as the acting. Keep your eyes peeled at the beginning for a brief acting debut by Princess Beatrice too. Highly recommended. I was lucky enough to be there on the world premiere night of The Young Victoria, and am so glad I won the tickets, never have I enjoyed a historical film more, the acting was superb, and the cast finely chosen, Jim Broadbent my absolute favourite, and Miranda Richardson excellent too. Even the horrendous weather paled into insignificance as we strolled down the purple carpet beside the stars, and Emily Blunt was as delightful in person, spending at least a good three quarters of an hour in that horrendous rain, meeting and greeting her public, as she was in the film, totally believable as the Young Victoria. I think this film will run away with the oscars next year, just you wait and see, the greatest love story of all time, will grab everyone just like it did me, the time passed in a flash, and I don't even like historical films, but I do now!! !